The Stuttgart plant of SCHAUDT MIKROSA BWF mainly supplies the automotive industry and its sub-suppliers with external cylindrical and non-round grinding machines and systems. Complete systems such as grinding lines, grinding cells, interlinkiing and handling systems as well as stand-alone machines can be supplied. Large external cylindrical grinding machines for general machine manufacturing and roll machining are built in the Hartmannsdorf plant near Chemnitz. Workpieces with diameters of up to 1000 mm, lengths up to 5000 mm and a maximum weight of 3000 kg can be machined. 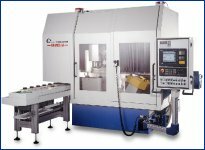 In Leipzig SCHAUDT MIKROSA BWF has specialized in centerless external cylindrical grinding and supplies customer-specific optimized machines of all typical sizes, including automation equipment. The machines are also designed for high speed grinding with CBN grinding wheels and are ideally suited for this grinding process. In Berlin SCHAUDT MIKROSA BWF builds highly productive internal cylindrical and combined internal/external cylindrical grinding machines with an emphasis on the automotive and subcontracting industries. Considered a competence-center to the anti-friction bearing industry, SCHAUDT MIKROSA BWF supplies, as required, application-specific internal cylindrical and external cylindrical grinding machines as well as superfinishing machines including the required handling devices.